Trick or treating is a fun activity to do with family or friends, but if you have a food allergy or sensitivity, this activity can feel challenging and scary. Peanuts, tree nuts, milk, egg, wheat, and soy are among the top allergens in candy that could be in your bag, putting you at risk for an allergic reaction. However, this does not mean you can never go trick or treating again! Below are some helpful tips to ensure a safe, fun Halloween night! 1. Research ahead of time if houses in your area are part of the Teal Pumpkin Project! The Teal Pumpkin Project was created by FARE, an organization dedicated to food allergy research and education. Families who want to partake in the project put out a teal pumpkin on their doorstep, indicating that they will be handing out non-food items, so passerby know this house is allergy friendly. Families can also add their home to the Teal Pumpkin Map. For more information or to look for houses in your area, check out https://www.foodallergy.org/education-awareness/teal-pumpkin-project/get-started. 2. Create a “safe list” of candy you can eat. Keep this list with you when trick or treating. When you arrive at a house with a big bucket of candy, use the list as a guide for what candy you can pick out of the hat. The list may also be important when sorting candy at the end of the night. If you have candy in your bag that is not safe, either give it to someone else, or throw it away. 3. Do not touch or take any candy or treats that are not wrapped. 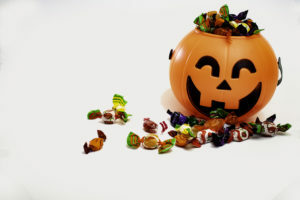 Unwrapped candy or treats, even if they are on your safe list, may have been cross contaminated with unsafe foods. It is better to just avoid them than risk the chance of exposure. 4. Wait to eat candy when you get home. When you get home, wash your hands thoroughly. Spread out all the candy and sort through to the ones that are safe for you to eat. Make a separate bag for these treats, and then dig in! 5. Read ingredient labels thoroughly. Sometimes, candy bars that come in different sizes (ex: fun size, miniature, etc) may contain different ingredients than the full size equivalent. Make sure to read the labels before eating! If the candy or treat does not have an ingredient label, consider it unsafe. 6. Throw an allergy friendly Halloween party! If the idea of trick or treating just feels too challenging, consider inviting friends over to celebrate instead. Wear Halloween costumes, watch a scary movie, and play non-food related games! Remember, take the emphasis off of candy and instead enjoy the holiday. Halloween should be a night to dress up and have fun with your family and friends!